So… what did I think about The Big Bang? Spoilers abound! Keep away if you haven’t seen the episode. I wrote last week that Steven Moffat had painted himself into a corner somewhat. This episode saw him not so much leap the wet paint in a single bound as redefine the notions of “paint”, “wet” and “corner”. This is a totally different episode to The Pandorica Opens in a quite remarkable way – so much so that at times it barely feels like a continuation of the same story. Much of it is absolutely dazzling. 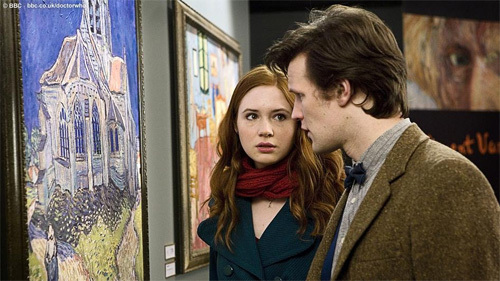 The return to the time and place of The Eleventh Hour, the brief sketch of a starless Earth (recalling Asimov’s famous short story “Nightfall”), the reveal of Amy inside the Pandorica “Okay kid, here’s where it gets complicated” and that’s just before the titles roll. Some of it is genuinely affecting – Rory’s double millennium stint on guard duty is a beautiful conceit – much of it is terribly funny – “I wear a fez now. Fezzes are cool. *toss* *zap* – a lot of it is both complicated and satisfying – Amelia is thirsty because the Doctor stole her drink in the past to give to her now because she’s complaining of thirst. However, much of it is also very dry. As the Doctor bounces back-and-forward in time, we delight in seeing the pieces of the puzzle come together, but it tends to feel more like completing a Sudoku than the catharsis of a dramatic narrative. Part of the problem is that stakes having been raised through the roof and then up another twenty storeys last week, many of the solutions come very easily this week. Moffat’s a rigorous enough writer to have provided one-line explanations for most if not all of the following gripes, but the fact is that none of them feel properly integrated into the story. A contradiction is still a contradiction, even with a throwaway pseudoexplanation. Last week the Pandorica was impossible to open and the Doctor was trapped inside it forever. This week it can be opened and closed at will simply by waving the ever-popular sonic screwdriver at it. 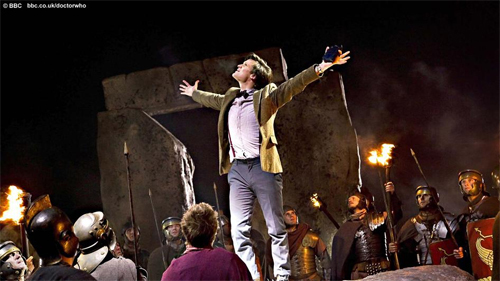 Last week the Pandorica was a device which rendered the Doctor incapable of further action. This week it regenerates anyone put inside it. Travelling in time is difficult which is why so few people can do it and why the TARDIS is so valuable. The time bracelet is repeatedly described as crude and nasty, presumably in the hope that we will never notice that it is in fact pinpoint and to-the-second accurate every single time it is used, instantaneous and in general better and more convenient than the often-unreliable TARDIS in almost every way. The whole idea of a “restoration field” is bunkum. For an explanation as to why, see my future blog post on the difference between science and magic. It’s that last point that I want to address now. As noted in the blog last week, as well as elsewhere, the supervillain alliance is risible as soon as you give it a moment’s serious thought. Moffat’s solution to this problem is to simply not include them in part two. In fact, throughout this peculiar episode, he simply drops concepts when they have no further role to play; Amelia disappears in the middle of the museum sequence with – again – only a single line to cover, Rory is controlled by the Nestenes only when it is required that he should be and so on. What this means, and what adds to the Sudoku-feeling of this episode, is that there is no charismatic and yet hissable villain in whose downfall we can rejoice. Yet, this is not peculiar among Moffat scripts. Here’s a quick recap of his stories and their “villains”. The Empty Child / The Doctor Dances – mindless nanogenes doing what they’ve been programmed to do. The Girl in the Fireplace – mindless clockwork robots doing what they’ve been programmed to do. Not one good villain among them. The Eleventh Hour probably gets nearest. Prisoner Zero him/her/itself gloats in a suitably villainous way, but isn’t the main foe. In the same time period, other writers gave us The Editor, The Dalek Emperor, Mr Finch, John Lumic, The Family of Blood, The Master, Miss Foster, Davros, the Dream Lord and Restac. What’s Moffat playing at? Then there’s the list of things which simply weren’t explained at all – some of these were trailed into the next series but many were never even mentioned. Why doesn’t Amy remember the events of The Stolen Earth? Why should the TARDIS exploding extinguish every star in the universe? If the Earth is orbiting the TARDIS as it explodes, just where is that brick wall which River Song can’t get past? How does remembering the Doctor bring him back to life anyway? Who is River Song and what was she in prison for? Now, all this may sound as if I didn’t much like it, but the fact is I really, really did. The lack of a good villain does make it hard for the Doctor’s victory to resonate, and the incomprehensible scale of the problem means that the solution seems intellectually interesting rather than emotionally satisfying, but there are moments of sweetness, tenderness, and even greatness at such frequent intervals, that as severe as some of these problems sound, they are mere niggles when you actually sit and watch the story unfold. River Song’s extermination of the stone Dalek, the dying Doctor’s last words inside the Pandorica, “I escaped! I love it when I do that” followed by the horrible realisation that he is simply pausing on the threshold of death, and most spectacularly, brilliantly, jawdroppingly wonderful of all – Amy’s realisation that what her wedding is missing is Something Old, Something New, Something Borrowed and Something Dimensionally Transcendental. Then Matt Smith dances like a loon, a pair of married companions hop into the TARDIS for the first time ever and we’re off to the Orient Express it seems. Whew. A fitting climax to a thirteen week run which was often astonishing, sometimes frustrating, but never (almost never) less than entertaining. I hope that next year the new production team will feel a little more secure in their roles, and some of wrinkles will be ironed out. In the meantime, I’m going to see what else this blog is good for, but if nothing else, I’ll be back to review the Christmas special. Geronimo! Meantime here’s my summation of Series Five. So… what did I think about The Lodger? Doctor Who - Season 5 - Episode 11 - "The Lodger"
Spoilers ahead, but as this is a week late, I shouldn’t think this is too big a problem. So, Moffat rounds up all of his sit-com buddies and gets Simon “Men Behaving Badly” Nye to write an episode which turns out to be a rather nice little “bottle show”. He gets Richard “Vicar of Dibley” Curtis to write another, which pleased some with what they saw as its heartfelt artistic passion, but which so irritated me with its cack-handed monster that I couldn’t buy into the emotion of the climactic scenes. 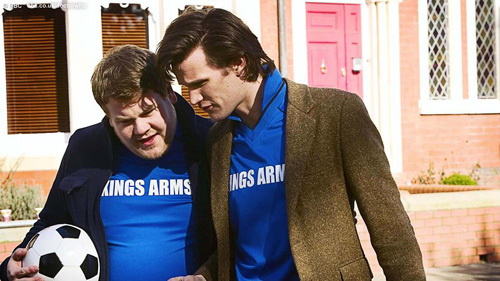 So it’s left to Gareth “The Shakespeare Code” Roberts to give us Timelords Behaving Badly, also known as the Smith and Corden show. Unfortunately for Doctor Who fans, this was within days of Corden and Patrick Stewart making total twats of themselves at that awards ceremony, and so it was with a certain amount of trepidation that we approached this slightly unusual episode. I thought that the set-up was fresh and funny. I like the idea of The Doctor having to spend several days passing as human, without the aid of a chameleon arch and a load of borrowed memories, without a companion to fall back on, and with the added complication of being dropped into a will-they-won’t-they-best-friends-each-too-scared-to-make-the-first-move situation. And, to his credit, Coren played his part with sincerity and wit and Daisy Haggard – so good recently in Psychoville – is also suitably vulnerable and yet not pitiable. Add to this a wonderfully creepy mystery up the stairs and Karen Gillan making the absolute most of the pretty limited opportunities she’s given and we should be all set, right? Right? Sadly, this is yet another near miss, in a season which has been littered with them. I’ve long said that history will record that Russell T Davies’ chief contribution to Doctor Who, once it was actually back on the air, was the care that he lavished on every single script, whether it had his name on it or not. Some, he simply burnished up. Others, like The Satan Pit, he rewrote from top to bottom. When he didn’t perform uncredited rewrites, either for contractual reasons as with Fear Her, or due to illness as with Daleks in Manhattan, the results were generally unpopular stories which languished at the bottom of season polls. Possibly the reason that some of his credited stories were not so well received is precisely because only one mind is at work on them. Moffat is thought to have a rather more hands-off approach to scripts. Pitching ideas to writers, suggesting plot turns here or character beats there. Protecting the tone through the production process, but nothing like the kind of top-to-bottom rewriting that the horribly overworked Davies indulged in. The result is that many of this season’s scripts – especially those without the name of the executive producer on them – feel a little undercooked, or have holes in the plotting which let them down. The Lodger is let down in two different but equally serious ways. The first is that, with no passionately ranting Welshman babbling about “truth”, too many gags have made their way in which can’t be justified beyond “wouldn’t it be funny if…?” The Doctor’s omelette-making is overdone, his behaviour in Fatty’s office does nothing to earn the praise which Fatty’s boss lavishes on him, his lack of knowledge social niceties is totally at odds with the Third Doctor’s easy bonhomie with UNIT soliders and Whitehall penpushers; his bewilderment at the sport of football is hard to take following the Fourth and especially the Fifth Doctor’s fondness for cricket, and his inability to integrate with Fatty and Doe-eyes is almost impossible to accept as a continuation of the Tenth Doctor’s Christmas Dinner with Rose and her family. All of which I could just about let go, if not for the fact that they fumble the climax so badly that it calls into question almost all of the preceding half-hour. Once Doe-eyes goes upstairs to her apparent doom, we the audience are well aware that the stakes are suddenly much higher than they were. But the Doctor has been steadfastly refusing to mount those stairs and find out what has been going on up there for days, letting innocents march to their death while he twats about on the football pitch or spits out wine or chats to Amy in the TARDIS. Suddenly, he has no reason to wait any longer, but all that’s changed is that Fatty’s caught him out. Any reason to wait still exists. If there was no reason to wait then he’s just let all those people die because… well, because pretending to be human was more fun!? Pretty much all of which could have been avoided if he’d known it was Daisy Haggard up there, but he doesn’t. He and Fatty run up the stairs, not knowing who they’re going to find. The final scene is well-done and if the slack plotting didn’t ruin it for you, then Fatty and Doe-eyes’ eventual reunion is both neat, resolving both plots at once, and satisfying, but it’s a shame that the villain is yet another Moffat implacable robot on auto-pilot, a reprise of the Chula nanogenes from The Doctor Dances, the clockwork robots from The Girl in the Fireplace, or the Atraxi from The Eleventh Hour. So, some funny lines. Some charming performances. A novel situation, but a lack of rigor, truth and care which left me more let down than entertained. Neither the disaster which this clash of genres might have been, nor the triumph given the talent on display. Three stars. So… what did I think about Cold Blood? Spoilers below, read on with care. Last week, I said I was going to withhold judgement on this two-parter until I’d seen how (and if) all the set-ups were paid off. I’m pleased to say, in general they paid off handsomely. But this was also an episode of two halves. We’ll get to the last ten minutes in a second, but let’s take the Silurian story first. It’s Stephen Moore doing a portentous voice over! Fantastic way to get me in a good mood, straight away. Totally unexpectedly, one of my favourite actors – one of those wonderful British character actors who’s been in just about everything but never, until now, Doctor Who – starts intoning gibberish over a picture of planet Earth, and even though the voice over telling us the end of the story at the start of part two is a complete steal from Doomsday, I just loved it. And, as I predicted, the episode kicks off with all the characters who had been held in stasis, suddenly springing into life. Amy finally escapes from her shackles, Ambrose goes mental with a taser and the Doctor rings the front door bell. From here on, it’s pedal-to-the-metal, will-they-won’t-they stuff all the way to the finish, with some lovely good-news-bad-news sequences and masses and masses of Silurians, swelling further the ranks of twenty-first century Doctor Who monsters represented by two-or-three fully characterised individuals with impressive make-ups and any number of interchangeable troops, their faces covered by helmets, masks or cowls (see also the Sontarans, the Judoon, the Sycorax etc). Is it perfect? Of course not. 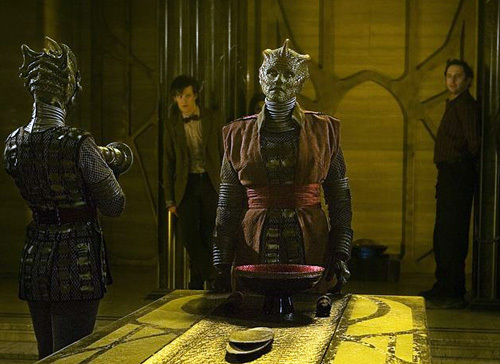 The Silurian/Human peace conference is unbelievably shallow and glib, as is the absurd division of Silurians into completely compassionate, open, sensitive and friendly on the one hand (Eldane, Malohkeh), and war-hungry psychopathic ape-haters on the other (Alaya, Restac). But this is Doctor Who – bold, colourful, exciting, fast-moving. Not some turgid political play at the Royal Court. Sure, they are broad brush strokes, but with performers as strong as Stephen Moore and Neve McIntosh, the script can trust them to find the shades of grey. Particularly fine was McIntosh’s little gasp of regret and grief at the sight of her sister’s corpse. And while I’m griping, the Doctor and Eldane’s solution is also both patronising and a cheat. Patronising because the solution to the problem of sharing the planet with homo reptilia is unlikely to be as simple as pressing the pause button and getting three people to start up a new religion. A cheat because the magic decontamination thing was in no way set-up. But amid the whirl and dash and energy, I still found it hugely enjoyable, even on a second viewing. Mo never grows a character, and Eliot seems to lose his – even his dyslexia’s not mentioned again, but Tony, Nasreen and Ambrose are all vividly written and strongly played. There are also hints that we haven’t seen the last of Tony and Nasreen either. Then there’s the last ten or so minutes. First of all, after three crackless episodes, the crack is back. Then just as I was wondering how long he’d be around for – boom! – Rory dies. Two death scenes in three episodes is quite a lot, and it’s a pity that as far as we’re concerned, Amy’s already lost him once. But to lose the memory of him too is ghastly and the Doctor’s guilt will be unbearable. One assumes that The Pandorica, when it Opens will have Rory-Restoring powers but, in the third of this episode’s triple whammies, it certainly seems to have TARDIS-fragmenting powers. Wonderful stuff, and as we race towards the end of Series Five I can’t believe so much has gone so quickly. Cold Blood on its own is easily worth four-and-a-half stars, but I can’t completely forgive the padded-yet-garbled The Hungry Earth, so four stars for the story as a whole. Next week – Vincent van Gogh as written by Richard Curtis.